Stepping outside for a deep breath of fresh air is one of life’s simple pleasures. But for some people, that same deep breath can prompt breathing difficulties or chest-tightening. If this sounds familiar, you may have adult-onset asthma. The resulting delays in diagnosis and treatment can lead to serious problems. Q: What causes adult-onset asthma and what are its symptoms? A: The reason adults develop asthma isn’t always clear. Respiratory infections, allergies and airway irritants, such as smoke and mold, can be triggers. While the symptoms for adult-onset and childhood asthma are the same, they are typically intermittent in childhood and persistent in adulthood. Inhaled and oral asthma medications, which open the airways and soothe inflammation, are used to treat acute symptoms and prevent flare-ups. Q: Is asthma more dangerous for adults? A: Yes. The death rate for adult-onset asthma is substantially higher than the death rate for childhood asthma. One reason may be that adults either ignore asthma symptoms or attribute them to being overweight, being out of shape or getting older. Unfortunately, any delays in the diagnosis and treatment of asthma can permanently impair lung function. Q: What increases your risk for adult-onset asthma? Being overweight or obese: A low level of physical activity, changes in lung physiology and higher levels of inflammation are among several factors at play. 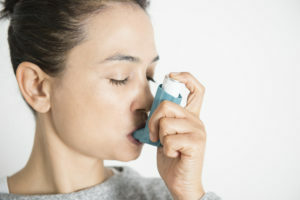 Being female: Hormonal fluctuations in pregnancy and menopause can trigger asthma. Allergens: Cats, cigarette smoke, chemicals, mold or dust can trigger asthma. Q: How well does treatment work for adults with asthma? Asthma medications can be less effective later in life, particularly for those who are obese. Oral steroids can worsen glaucoma, cataracts and osteoporosis. Being on beta-blockers for heart problems can increase the severity of asthma. The lungs and chest walls are stiffer and the muscles supporting deep breathing are weaker in adults. For these reasons, adults with asthma are at increased risk for flare-ups and even hospitalization. Q: How can you improve your asthma control in adulthood? Take prescription drugs as directed. Consult your doctor before making any changes. Let your doctor know if you are taking any over-the-counter medications. Monitor your lung capacity. Visit your doctor frequently to have your lung function checked. You can also monitor your lung function at home with a peak flow meter. This will detect lung changes even before you notice them. Develop an action plan and follow it. Create a step-by-step treatment plan with your doctor that walks you through what to do if asthma symptoms worsen. Use your rescue inhaler correctly. This can be the toughest part of managing asthma (especially if you struggle with strength or dexterity due to arthritis or other health problems). If using your inhaler is too frustrating, ask your doctor about nebulized medication that you can breathe in over 10 to 15 minutes. If you suspect you might have asthma, see your doctor as soon as possible. You’ll breathe a whole lot easier once you address the problem.